The new VRB wireless headphones are going to be something your friends ask for on their Christmas lists. These headphones look sleek and stylish. I haven’t had a chance to try them personally however I think they deserve some love! The designer got pretty clever with the name too! Take a look at the video to see how she describes it! VRB headphones brag of a wireless range of up to 33 ft. and 15 hours of continuous play. You can even skip/play/pause from the headset. They also boast of a built in Bluetooth mic and voice command synchronization. This simply means that there is no background noise. I like the idea of that because I hate hearing other things when my ear buds are in. For us ladies there is no worry about snagging our earrings or hair because the design is friendly for both. When I took a looked at the Kickstarter campaign for the new VRB headphones I found out some interesting tidbits. The first thing is that they are compatible with ANY Bluetooth 3.0 or 4.0 device. This is good because sometimes Android users get left until last! These babies are also sweat proof so you can crank out some reps at the gym and not have to worry about ruining them. They are covered by a one year warranty if you did ruin them though. 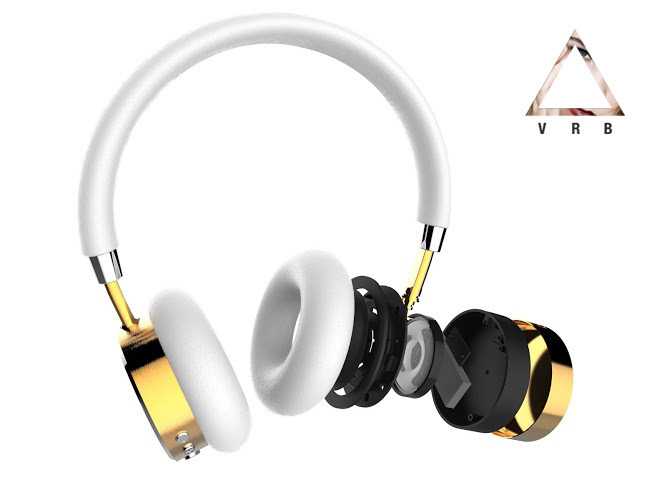 Last, but not least, VRB headphones are adjustable to fit any head. I think that my favorite are the white with gold because they look so fancy. The part that goes over your head looks to have some cushion so that would sit nice on your head too! Your VRB headphones come with a carrying case, USB cord, manual, and some stylish stickers. Now won’t you go check them out and contribute to the Kickstarter campaign? You can find VRB on Facebook, Twitter, and Instagram. A new blogger just trying to find my voice in the world. This Brunette Blogs is a multigenerational beauty and lifestyle blog. Copyright This Brunette Blogs© All rights reserved.